Hook, line and sinker. – Dirty wet dog , boats and sailing. Many of my regular visitors will have ploughed through (sorry…deliberate anchor pun) the long post about my new anchoring experiments with WABI”’ . Astute observers will have noted that the boat looks a bit different from the photographs i used in that post and, as with the Friday 5 minute blog, now sports a little bowsprit out front. 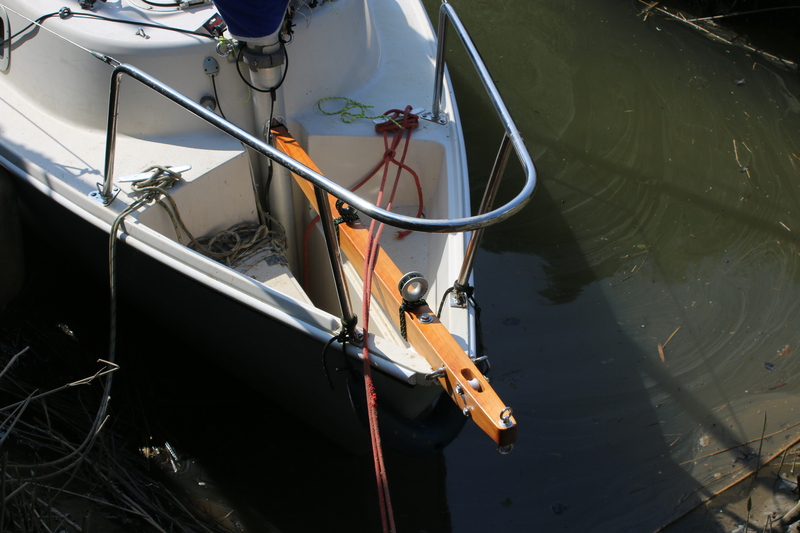 As i write, and once again i am writing a couple of weeks ahead of post scheduling, the little bowsprit : Le Petit Prod, is on but will have come off for it’s second or third stage modifications but it has been built, fitted and used. I realised today that the photograph above is just about the best one of the bowsprit itself because the overall shape and concept is visible. It looks very odd to the eye because the working (outboard) end is to the left and the inboard end to the right. That makes it almost the complete opposite of a standard bowsprit, most of which is outside the boat. In this case the long ‘tail’ attaches to the mast in this little fitting below which i had fabricated recently. My plywood pattern is on the right here and the complete piece on the left. Just for reference this was fabricated by Pheonix 316 in Plymouth and they have done a nice job with it. Just as an aside they also modified the lid of my charcoal heater such that i can use it to boil a kettle on the stove. The purpose and function of the bowsprit is twofold : to mount the anchoring and mooring rollers/fairleads and secondly at some time to carry a small free-flying jib for light upwind sailing. I have been advised via the owners association that the Liberty can be improved upwind in light weather by flying a small jib…..it sounds as though the jib off a National 18 racing dinghy will do the job……however. The actual timber sprit i made from a useful looking length of very close grained pine that i heaved out of the timber rack down at Stax reclamation yard just outside Saltash. At first i thought the piece i found was way too big and it was pretty old and nasty looking with some serious iron nails poking out of it. I initially bought the piece for just a few pounds with a different project in mind but when i got it on the bench i realised that what i had would work very well once planed down a lot and shaped. The iron nails/spikes took a lot of time and ingenuity to hoik out of the pine but the wood itself is much higher quality than modern, commercially available timber. It’s dense and close grained and of course significantly lighter now that iv’e had at it with the power planer. Below….that’s my first attempt at making mounting chocks to sit on the floor of the bow well, clunky and way too heavy, the stainless steel mast bracket is so much neater and lighter…..even Al might pass that one ! I have always liked the idea of taking an anchor warp down through the bowsprit itself rather than having cheek mounted anchor rollers. On the Liberty the bowsprit will sit in the broad groove/channel through the bow molding and if i kept the bowsprit base at maximum dimension there i would have enough ‘meat’ on the timber to bore out a slot to take a couple of sheaves within the bowsprit itself. I roughed-out sketches of different sheave arrangements and therefore the slot shape and size and what looked best was a pair of wide but small diameter sheaves rather than one large diameter sheave which would have meant taking a lot more timber away. In the final build iv’e actually ended up experimenting with 3 different sheave sizes so far and currently just a wide stainless steel bush acting as the bottom roller….that’s got at least one more stage to go as i narrow down on the exact sheave size and get them made locally as well. The actual arrangement for anchoring is that the warp will run over the 2 sheaves through the bowsprit and will then run to, and along the side deck to the anchoring cleat just ahead of the cockpit. This is similar to the old closed fairlead except that there should be much less friction in the system. The sheaves and sheave slot should reasonably take a 12mm dia rope which is still over-spec for the job. I think that because i come from much bigger boats that i still look at some gear for the Liberty and think of it as being too light. Most information points to 10mm line as being perfectly adequate mainly because WABI”’ is actually a very light boat…only about a ton and a half fully loaded. The 6 kg Rocna is completely adequate for my everyday needs and the 7 kg Manson is over-spec although it was a very good anchor for the similar length but twice as heavy Inanda. The current sticking point in the job is the fastening at the bow. My original plan was to cut an access hole in the narrow forward face of the bow well, drill and pass a bolt up through the bow channel molding and fasten the bowsprit down using an eye nut over the bolt head ….obviously on the top face of the sprit. I cut an access hole as planned but it’s small size and the angle of the actual bow didn’t then allow me to pass the long (160mm) bolt up through the molding. The temporary solution was to pass the bolt down through the bowsprit and through the deck groove and attach a nut from below…..with extreme difficulty i may add. That means i would currently have the warp running over the flats of the bolt head so i have temporarily lashed a large , low friction eye there as a smooth fairlead. The next stage will be to take the bowsprit off again, enlarge the access hole and get the bolt in from below if it is at all possible. The access hole will then need a little cover making for it. The other part of the job will be to drop the stick again and do the modifications on the mast itself to get rid of the 2 lazy-jack fittings and add a jib attachment point. The other kit on the bowsprit is an eyebolt/eye-nut combination that act as fairlead/keepers for the mooring lines or strops that i tend to use. While Chris’s moorings (and many others round here) have a heavy pick-up and mooring warp that is too large to go through an eye, they also have a top swivel and shackle so i carry a custom made mooring strop for long term mooring and a simple plain line for everyday use when i ‘borrow’ a mooring in the river…..i .don’t do that often but it’s useful once in a while. So : line and sinker. I know this keeps changing but my current version of ‘anchor for the use of’ is Rocky Rocna, 10 metres of 7mm chain and temporarily on a length of 10mm polyester line as the warp although that’s about to change when the new line arrives this week hopefully so lets talk about anchor warps. As with most sailors i have nearly always used nylon warp for my rode as is standard, except that for most of the time that iv’e had WABI”’ i haven’t done that at all, in fact for years i have been anchoring on weighted polyester braid and it’s been completely successful. Only recently did i briefly use my old 14mm spare anchor warp from my Frances 26 simply because i still had it. I have always kept the 75 metre warp on board because i firmly believe in having one very long warp on board and it has served that purpose. It’s only been used once when i walked the spare anchor out on it that one time in St Aubyn bay when i set a haul-off kedge anchor out to seaward of the boat. The 14mm octoplait is very over-spec for WABI”’ as is the similar 14mm weighted polyester line that i have been using this last 3 years. The weighted warp is the commercially available one that comes with , i guess, a line of small weights inside the last part of the core. They are advertised as RIB/small boat anchoring lines, the idea being, i believe, is that the weighted warp acts more like chain than rope but is much nicer to handle. My one came as a useful 40 metre length in a neat bag and as i say has been in continuous use for years. That line still looks to be in perfect condition so it’s now stowed below with ‘Marilyn’ (Manson) and 15 metres of chain…..all shackled up and ready to use. Now, this is going to get a bit rope-geek but as an ex climber and rigger i have to know my way around ropes a bit so i just want to add a bit of rope geekery here. Right now, aboard WABI”’ i have several different types of modern rope in use which come directly from the riggers shop and they would be instantly recognised as everyday sailing rope. Mainly i use bog standard but better quality braid on braid polyester….i happen to like Marlowbraid as i have always found it reliable although other manufacturers make equally good line. For halyards i am currently on ‘cruising’ Dyneema which has a Dyneema core with a braided polyester sheath although i do have some pure Dyneema hanging up in the workshop. I couldn’t tell you today which version of Dyneema it is although it was eye-watering expensive so it’s a good one. That line will replace the cruising Dyneema as and when i get around to the job. Some readers will know that i like to lash and lace rather than using shackles to mount blocks so i use loads of small diameter and very high quality Dyneema line for that task and i keep plenty spare on the boat. Where i differ with most sailors is that i look to climbing and caving/arborists rope for other uses. The rope i have just sourced, new but old stock, is what is called semi-static line which is commonly used for abseiling, caving and rope access work. It is similar to climbers ‘dynamic’ line except that it has much lower stretch and as a climber you wouldn’t want to take a high factor leader fall on it as it wouldn’t ‘give’ (stretch) enough . Semi-static rope is a lower stretch version of climbers ‘Kernmantel’ and as i say above is more commonly used as a descent and ascent line, often in caving and abseiling. If you see ‘LSK’ mentioned then that i believe is low stretch kernmantel. It often has a very high strength rating : the one i have sourced is rated at over 6,000 lbs and near to 30 kn force rating. There is no way that i could apply that much force manually or i think during normal anchoring. If anything like that force was somehow applied on the gear i suspect all the fittings and cleats would just rip out of the deck !. I think that it might be a surprisingly good rope to use as small boat anchor warp and at 10 mm will be small in volume and large enough to handle. Aft, i am working on the anchor stowage and the anchor recovery aspect. At sea the anchor shown below. When motoring it will move to just forward of the motor. Here, what’s happening is that i’m about to fit the teak deck slats that will allow the anchor stowage box to drain properly….except that i’m not because i have completely run out of Sikaflex and can’t be bothered to drive the 40 mile round trip just to buy one tube. The retrieval roller is fitted but it will make a lot more sense to do a quick video when everything is complete and working…..then i’ll capture some footage of just anchoring and retrieving/stowing the anchor. By then i’ll have probably changed my mind again and Marilyn will be back in the number one spot…..i rather like Marilyn. Fitting the drainage slats and the temporary rope/chain bin. I realised when i was writing the rope-talk section above that not everyone here will be familiar with rope techniques and rope technology from other disciplines outside of sailing. So, climbing first. I’m most familiar with climbing practice having done that myself for several years. Rock climbing as i knew it is now referred to as ‘trad‘ or traditional climbing and today there are other specialties, for example ‘sport’, big wall and of course ‘free‘ or unroped climbing. In trad climbing what happens is something like this : the leader, ties one end of the rope into his or her climbing harness and their ‘second’ ties into the other end. Nowadays it can be a bit more complex as what iv’e just said refers to the use of a single rope…even in my later climbing years we often climbed on ‘double’ ropes….2 ropes but thinner which allowed ‘protection’ placement to the side of the actual ‘line’. As the leader proceeds elegantly, or not in my case, up the route, he or she places ‘pro’ (protection) in the form of chocks, nuts and cams, into features in the rock. The climbing rope or one of the ropes is then clipped in to that with a ‘crab’ (carabiner). The idea being that if the leader takes a fall they only fall twice the distance they are above their last piece of protection and assuming that the second is awake enough to arrest the fall. A long leader fall puts an enormous shock load on the rope and ultimately on the climber…..which is why a climbers rope is designed and made to be ‘dynamic’ ie stretchy. A climbing rope is only rated for a number of falls with a high load (fall) factor and even one very long fall can result in the rope being binned afterwards. Old climbing ropes make very good mooring lines by the way. The second use of a climbing rope is to initially access the route when the climbers first have to abseil to the start of the climb. That is typical of many routes that i did on sea cliffs : places like the Holyhead stacks and many places on the Gower peninsular. For my best ever day on the rock we had to abseil some 55 metres into Wen Zawn at Holyhead’s south stack onto a block of rock about the size as my garden bench…..some 50 metres below us and just awash at that state of the tide……the punch line here is that we then had to pull our ropes down on top of us to start the climb. ‘A dream of white horses’ (Gogarth) Ed Drummond photograph i think. Me and 2 mates did this route way back when i lived just down the road in ……wait for it…….Llanfairpwllgwyngyllgogerychwyrndrobwllllantysiliogogogoch…..yes, i actually lived there. After i had led off on the first pitch i noticed that my 2 mates were chatting with another couple of climbers that had roped down as well. That only turned out to be none other than THE Joe Brown himself . Having never been a caver or arborist i don’t have any practical experience with static and semi-static ropes (LSK). Static ropes, by the way usually aren’t nylon at all but often polyester for arborists and cavers and then aramid for military ‘fast-roping’ techniques. I did at one time have several friends working in the rope access world : doing abseil inspections off tall block of flats mainly, and i got some knowledge from them. It seems that in caving, tree work and rope access work a less stretchy rope is desirable and that ‘leader’ falls are much less likely. Where a ‘dynamic’ rope is designed to have considerable stretch or bounce a semi-static rope isn’t….they will still have much more stretch than say Dyneema or Aramid lines though. I had to take a quick look around the world of semi-static ropes for this project and managed to source some unsold but old stock line. The rope i have bought does feel very dense so it should be high modulus….it seems to handle nicely although it is stiffer than ‘floppy’ nylon 8 plait but then it is higher rated. In it’s uncut state (about 50 metres) it does look a bit over-long for the job as i rarely have run out much more than 20 metres of warp after the chain…..i might back up a bit on this one and keep the long length of semi-static line as my kedge warp in place of the 14mm octoplait. For information on static and semi-static ropes take a look at this link as it lays out current practice far better than i can . Previous Anchors…..heresy, holding and handling. Next Hot project for a cold beer. Hello. I’m refitting an abandoned 25′ Westerly and have been considering how to heat it and rig it, as the only thing left of the original rig is the mast, so I thought about getting creative. I just read about your installation of the Pansy Heater and your plans for a junk rig. What happened to the junk rig project? Meanwhile, the Pansy looks very good, especially as I plan to take this boat north where I will no doubt spend a lot of time being wet! I think the pansy stove is one of the best things I have ever bought for a boat, if I can get one to fit in a relatively small 22′ then you should have little problem fitting it on the Westerly. I didn’t take the junk project any further forward because I now think that there are better and simpler solutions for the Liberty. One of the main problems with a junk conversion is that I would have had to build 2 new masts and then all the junk gear. I have seen one Junk conversion on a Liberty which is nice, it appears on the junk website although it’s owner is actually a bit equivocal about it’s value. I have gone down a simpler route using the existing masts but changing the booms to sprit-booms. Could you elaborate on the feedback you’ve had about the junk? It’s easy to find plenty of praise for it on the one hand (JRA) and plenty of condemnation of anything that’s not a bermudan sloop from the hide-bound white boat brigade, but difficult to find much middle ground objectivity. I’ve costed both options: replacing the Westerly’s original rig and sails vs. a new junk mast and cambered sail, and the junk comes out significantly cheaper. But I’d like some perspective on what it’s like to live with! This will ultimately take a far longer post to answer and i’m at work so i only have limited time this morning……it’s my very last day by the way. The short answer with the Liberty is that the original masts aren’t strong enough for a junk rig and that view comes from Liberty owners and the HLMOA generally. The original masts are barely strong enough for the less powerful cat-ketch, in fact several of the early ones broke. Mine being quite old alloy sticks now will have been subject to thousands of load cycles and i suspect will break one day anyway. I did speak to a previous member who had a Liberty and 2 complete rigs…..original bermudan and a complete junk-ketch. The junk version had 2 newer and heavier masts. The longer answer needs quite a bit of explanation from the one serious work on the subject which is Blondie Hasalar’s book on practical junk rig…..i don’t have that to hand so i can’t, for example, quote from his work on mast scantlings which is critical to junk rig safety. In my end of month blog, mostly written but not edited yet, is some relevant sections about weight and weight distribution…..that being one of my principal objections to the rig on a Liberty. Plenty of food for thought here — thanks again. Looking forward to the anchor set-up video. Keep subverting the dominant paradigm Steve! The Dashews have some good stuff on warps for anchoring in the Cruisimg encyclopedia ( now availible as a free pdf download). They thought polyester was better than nylon in many ways due to the problems with excessive heat buiildup in nylon when used in extreme conditions. They even started to experiment with dyneema warps and mooring lines. Worth a read. Enjoy your writing. Thanks, I tried but couldn’t download the Dashew’s work, shame because I remember them as being genuinely experimental with their boats.